Nevada is located in the Southwest portion of the State of Missouri. (1) Originally called Nevada City, the community grew out of the municipal organization of Vernon County and was chosen as the county seat in 1855. During the Civil War in 1863, the entire town was burned by a company of federal militia; Nevada (along with Ft. Scott, Kansas) was an area of major conflict and border wars throughout the historic War Between the States. After the war ended, the City officially incorporated and changed the formal name of the community to Nevada. The community saw the arrival of the Missouri-Kansas-Texas (Katy) railroad in 1870, and welcomed the Missouri Pacific railroad in 1880. Another major development in the history of Nevada occurred in 1887, when the state of Missouri established the State Mental Asylum in Nevada. The Asylum was a major employer in the community until its forced closure in 1973. Even though the historic institution is no longer operative, many successor agencies are still major contributors to the area’s economy. Today, Nevada’s residents and business owners participate in the major industries of agriculture and manufacturing. Life in Vernon County offers the advantages of rural living with quick and easy access to amenities such as professional sports, opera, art and cultural events of nearby metropolitan areas. 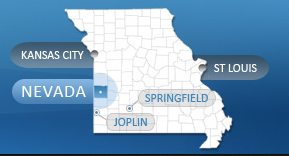 Nevada, Missouri is 90 miles South of Kansas City, Missouri 95 miles North West of Springfield, Missouri and 45 miles North of Joplin. Major life-style attributes in Nevada include sense of personal security as a result of very low crime rates, a values-oriented public school system that promotes personal and ethical standards while delivering quality academic training, commuting times measured in 5 and 10 minutes, unlimited levels of civic participation and involvement, a friendly community of neighbors of common backgrounds and attitudes, extraordinary housing values, and a modest tax structure that allows area residents to enjoy the fruits of their labor. Metropolitan attractions are only short distances away and are easily accessible to Nevada residents. The closest major shopping centers are within a short drive on four-lane U.S. Highway 71 – Kansas City, 90 miles to the north, while Joplin is 1 hour south. The Lake of the Ozarks area offers outlet shopping adventures less than 2 hours away for a scenic day trip through the rolling foothills across U.S Highway 54. Life-styles in Nevada represent the best of comfortable small town living, with the advantages of a more metropolitan setting. While every area has an array of entertainment and recreational options, it frequently is difficult to take advantage of them because of over-crowding, high prices, and commuting times, etc. In Nevada, on the other hand, abundant recreational and entertainment options are readily available, and more importantly, are easily accessible and affordable. It is commonplace for persons to be on the golf course 10 or 15 minutes after leaving work. Water enthusiasts literally can be sailing, skiing, or fishing in the crystal clear waters of area lakes within an hour’s drive-or even less if you know a friend with a pond out back! In the summer months, we can take advantage of two-three hours of leisure time activities before twilight. Popular with visitors and locals alike are our historical attractions and murals, many of which are centered around our prominent Courthouse Square and central business district (circa 1908). Our Bushwhacker Museum and Old Jail draw genealogical and history buffs, as does the “living museum” housed in the W.F. Norman Corporation, which is still producing original cast tin ceiling tiles for over 100 years. The Community Council on the Performing Arts provides year round entertainment under the newly restored eaves of the Fox Playhouse just south of the square. A complete “Adventure Map” attraction guide is available upon request. Becoming accustomed to the entertainment and recreational opportunities in the Nevada area may require a change of perspective and mind-set, particularly for newcomers from crowded cities. First, some of the activities are different in nature than may be common in many areas. Second, virtually all activities are easily accessible and affordable. Third, local residents simply have much more time with a greater sense of security to participate in whatever endeavors interest them.